So I've been having issues with running the game on full resolution as it doesn't use my Vram from my hybrid GPU effectivley. That's fine and that's an issue that is currently being worked on, but does anyone know how to change the resolution of the game? On the first alpha client I could scroll down the window manually and the resolution would adjust to whatever I scrolled the client down to. On the second release the client no longer adjusts the resolution and I can't see the other half of the screen because of this (I can't play :E the game because of this) I want to run the game in 800X600 or lower resolution, but the game settings at startup are locked on 1650X1080 (My monitor's resolution). I can't change it regardless if my monitor is plugged in or not there are no other options. I've looked through the files and haven't found a configuration.ini file to change the setting manually so I'm like what's going on. 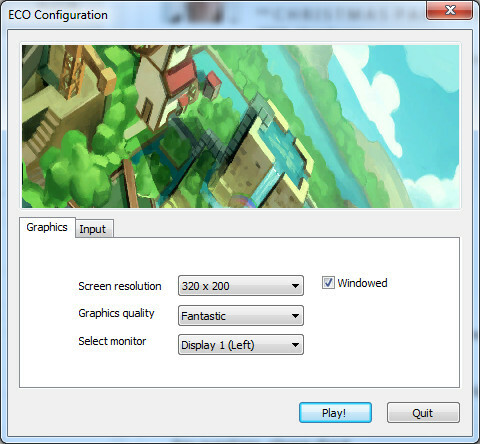 When you start the game, a configuration screen comes up, where you can set the resolution. Just checked it on my work PC, and I am able to play as low as 320x200 in windowed mode. Thanks for the reply and enthusiasm, but you didn't see the part where I explained what you just said and how it doesn't work for me and is locked at 1650x1080. Hopefully this doesn't sound harsh maybe my grammar didn't fully convey the whole message and if that is the case then I apologize. @Leroy_D Truth be told it might be a personal issue where when I built the Exo.exe using unity before the standard clients had been released. Unfortunately, it seems to be a problem for the devs then. On my system, applying settings is working fine. Does anyone know where the Resolution and Gamepad settings are stored, because they have to be on my computer somewhere As the settings go from Client to client. I've tried clearing the appdata...so where else could they be? You my fine sir shall be remembered in days to come. @Leroy_D: Can you provide a screenshot showing the registry entries? Okay those entries look a bit weird. Set Screenmanager Resolution Height_h2627697771 to 600 in decimal and Screenmanager Resolution Width_h182942802 to 800 decimal and try again, please. Funny stuff right? makes no sense. Have you tried removing the check in "Windowed"? Yea, nothing changes except it starts full screen. It literally doesn't matter what I set my screen resolution to it always pulls the max resolution and I don't know why. Alright, let's not fool around here. Do you have Skype? If so, you can send me your Skype name in a private message and then we'll find out what is causing this. Teamspeak would work as well, I have my own server. If we find a solution, I will post it in this thread for others who might encounter the same problem.